BJP president Amit Shah dialled Shiv Sena chief Uddhav Thackeray Monday as a part of his efforts to finalise a seat-sharing agreement well before Lok Sabha polls. The Sena chief, according to sources, sought a return to the 1995-formula to share Maharashtra Assembly seats with the BJP, when the Sena contested 169 of the 288 seats, while the BJP had fought 116. Then, the two parties had secured a total of 138 seats — the Sena 73 and the BJP, 65 — and formed their first coalition government in the state, headed by Manohar Joshi of the Sena and supported by independents and others. Apart from the quota of seats, this arrangement would mean that the Sena would choose the chief minister in the event of both parties forming a coalition government in the state. While Shah is keen on stitching a deal vis-a-vis the Lok Sabha polls, Uddhav, his priority being the assembly, is determined to negotiate for a package that involves both. As leaders of the bickering allies indulged in hard bargaining earlier, by evening, Sena parliamentary party leader and Saamana executive editor Sanjay Raut turned up at Andhra Bhawan in New Delhi to demonstrate his support to Andhra Chief Minister N Chandrababu Naidu, who was sitting on a dharna against the Central Government there. The message to the BJP was clear: the Sena has other options too. 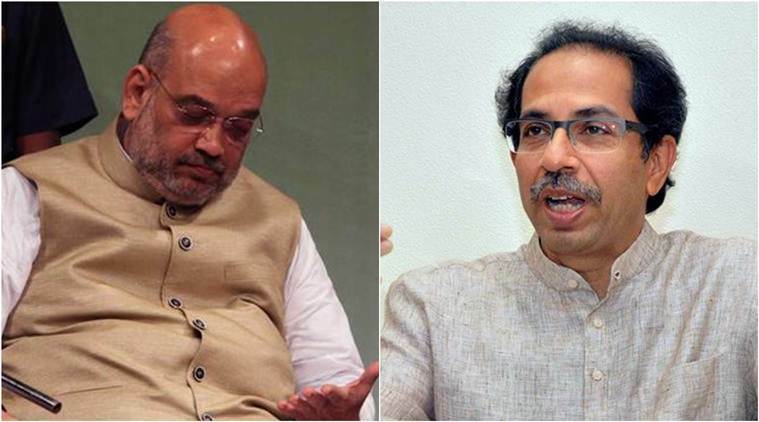 Shah’s phone call to Uddhav comes after a visit by poll-strategist and JD(U) vice-president Prashant Kishor to Thackeray’s’ residence to broker a deal between the two parties. Kishor had reportedly offered to get the Sena 28 of the 48 Lok Sabha seats from the BJP in Maharashtra in the event of a compromise and also enable the former to win 21 of them. Though Sena leaders remained non-committal to his proposal, they had underlined that they would not budge from their basic position that the Sena will have to be accorded the role and position of the big brother in Mumbai. The Sena had been emboldened to get tougher with the BJP after watching the JD(U) force the BJP to concede to it even five of its current Lok Sabha seats in Bihar. Deserted by many allies — including the TDP, the Rashtriya Lok Samata Party, the Asom Gana Parishad and the PDP – in the last year, the BJP is struggling for allies at the moment. Shah’s target is to facilitate the emergence of Prime Minister Narendra Modi as the leader of the single-largest block of parties post the Lok Sabha polls to qualify for a Rashtrapati Bhawan invite first to form a government. Knowing this weak spot of the Modi-Shah duo, allies are pushing them harder. Despite pressing the 1995-formula, the Sena may ultimately settle down for half the seats, besides one more, which means a final figure of 145 seats. This would imply a big climb-down for the BJP, which, contesting separately, had won 122 seats in 2014, compared to the Sena’s 62.